Roli Delgado’s Straight Ankle Lock Arsenal download is now available. For only $19 you get 11 high percentage leg locks from the teacher of World Champions like Marcus Almeida Buchecha, Rodolfo Viera, Rodrigo Cavaca, Cyborg Abreu plus 17 Bonus Instructional Videos of Denilson Pimenta – 3X World Champion from GFTeam Brazil! You want to double your effectiveness on the mat? Attack more ankles. Seriously. Ankle locks are the great equalizer. You can make the biggest guy in your academy cry for mommy with a simple ankle lock. Trouble is, most guys are doing it wrong and struggle to get a fast finish. 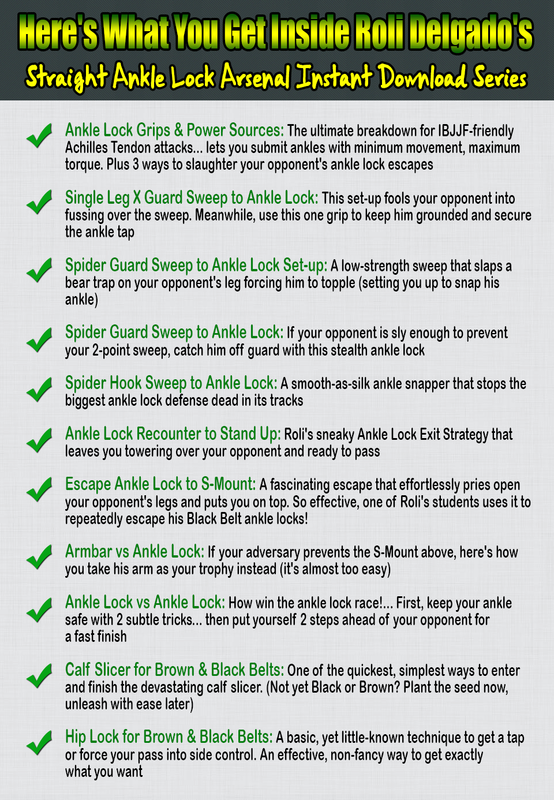 Now you can win the respect of any opponent in seconds with the proven straight ankle lock secrets of Jiu Jitsu Black Belt Roli Delgado, the master of legal lower body attacks. This guy’s instruction is so precise and effective, it’s sought after by some of the top BJJ World Champions. In this new video instructional series, Roli reveals the essential details to every ankle lock. You’ll discover how to sneak ’em in from the most unexpected places. You’ll see how to counter your opponents attacks, beat them to the submission, and much more. Welcome to your next Jiu Jitsu game-changer! Roli Delgado “The Crazy Cuban” is one of the most experienced Black Belt Jiu Jitsu instructors in the Mid-South. He weighs in at just 145 pounds but can snap an ankle like a toothpick faster than you can scream for mercy. One of the keys to his amazing lower body attacking game is that he trains many fighting styles, like the notoriously destructive art of Catch Wrestling (where your legs and ankles are constantly under fire!). Roli is the go-to instructor for legal leg and ankle locks and the secret weapon of many top World Champions including Marcus Almeida Buchecha, Rodolfo Viera, Rodrigo Cavaca, Cyborg Abreu among others. And if Roli is good enough for them, he’s good enough for you.